As you may already know, I'm no social media maven. And, as you can tell from this blog, I'm not really a heavy poster. 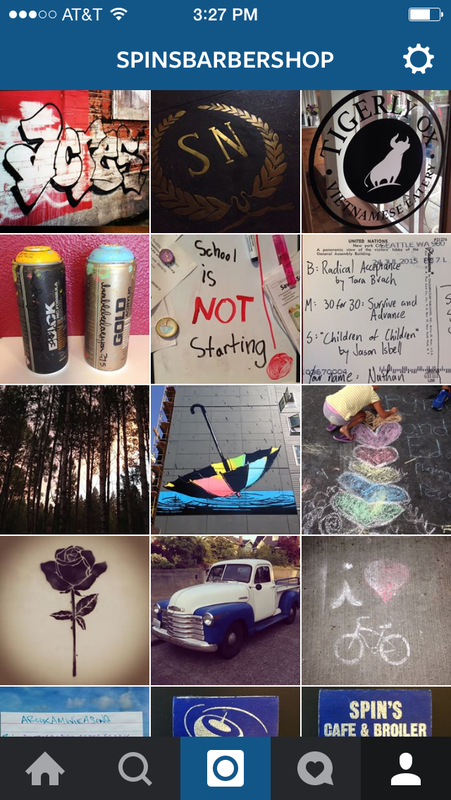 That being said, with some worthwhile encouragement from my good man, Eirik Johnson, I've taken to Instagram. I like that it's image driven, and the ease and simplicity appeal to me. It's been said, "A picture is worth a thousand words." I agree. And what's nice, is that on Instagram, you can also write a thousand words (well, I haven't exactly tried, but I think you can include quite a bit in your caption) - which also appeals to me. So, if you're reading this, and you have an Instagram account, please follow me on Instagram (@spinsbarbershop). I'm not going to abandon the blog - it's still my placeholder on the mighty, mighty interwebs. But, I'm a lot more likely to push information into the ether on Instagram because of it's aforementioned ease and simplicity. I think it can safely be said that "Boys in the Boat" got a lot of local (and national) love over the past couple years. Readers connected with the story, the historical context, and the fact that it was set in our very own Seattle. I'd like to recommend another Seattle-based book that received significantly less shine, but is easily as worthy. It is also about a team, but it is also about so much more. The book is called "The Hustle" by Doug Merlino. While in middle school, Merlino played local rec league basketball on a purposefully integrated team. Twenty years later, he tracks down all of his former teammates after learning that one of them has been brutally murdered. In examining the trajectory of the members of this 1986 team, Merlino takes a deep look at race, class, education, neighbor-hood, opportunity, and growing up in a city that is more segregated that we like to admit. If it were up to me, "The Hustle" would be required reading for all Seattle high schools, as well as part of the freshman reading list at University of Washington. Next time you're at the shop, I highly recommend you take a few extra minutes to stroll over to Stoneway between 45th & 44th. On the west side of the new apartment building, you can soak in the site-specific stylings of LA street artist, Bumblebee's latest work. Commissioned by the Mack Urban development group, Bumblebee was flown up for a two week painting stint. The results are well worth the stroll. (The mural is too hard to see driving by on the street. Your best bet is to stand in the Walgreens parking lot and look east.) 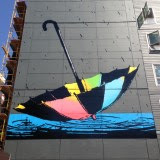 A four story, two piece blast of playful color awaits your eyes. 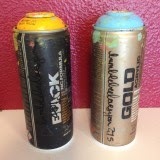 "Umbrella"(part one of two) And the cans that created it. 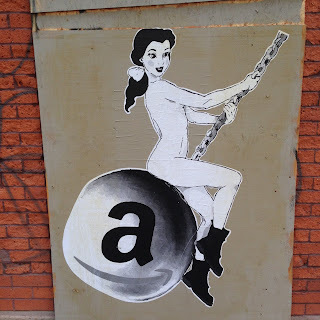 A bit of provocative street art from the bustling blocks of Ballard Avenue. On an abandoned building across the street from the Hotel Ballard and Stoneburner. To me, it says Amazon is wrecking/changing the face of the city, yet it remains veiled in the fleeting beauty of a pretty pin-up girl. The vibrance is alluring, but the dramatic changes could prove destructive. What does it say to you? The other weekend, I was strolling down an alley in Montlake with my friend, Casey and our respective kids. As I looked to my right, I spotted these bricks - part of an exposed and well-aged retaining wall. 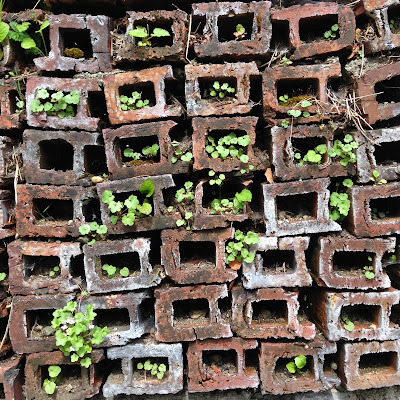 I'm not sure why I was so taken by these bricks. Partly their unique shape, partly the way the light was hitting them, and partly the newness of the little green bits foliage sprouting from something so visibly old. I quickly snapped a photo, and we continued on our way to the park. As I look at this shot, I think, man, I like these bricks. It's been a while, but I wanted to let you all know about the incredible show I saw at The Crocodile just last Friday. Some local cats opened, a kid from Brooklyn held it down with fantastic breath control and some great punch lines, and then a couple of authentic hip hop practitioners took the stage. 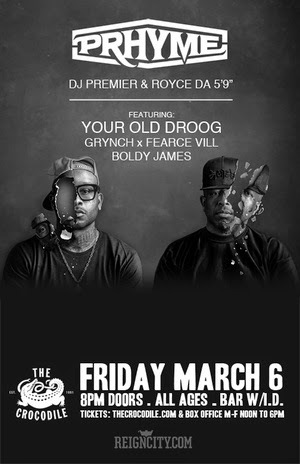 DJ Premier & Royce the 5'9" have worked together in the past, and now have recorded an album together, and are touring to support said album. Together they are "PRhyme." And as this dynamic duo, they share a philosophy and reverence for purity, and bring that to their music - and to the stage. Primo flexed his muscles on the wheels of steel, while Royce paced the stage like a panther, spitting to a sold out crowd. The best part was my cousin and I brought along his 14 year old son, who has a budding interest in hip hop, and was excited to take in his first live show. As far as fist shows go, this was a heck of a maiden voyage. As you may know, I'm more of a cocktail guy. It's not that I don't like wine, I just don't know that much about it. I can tell the reds from the whites, but that's about where my knowledge leaves off. 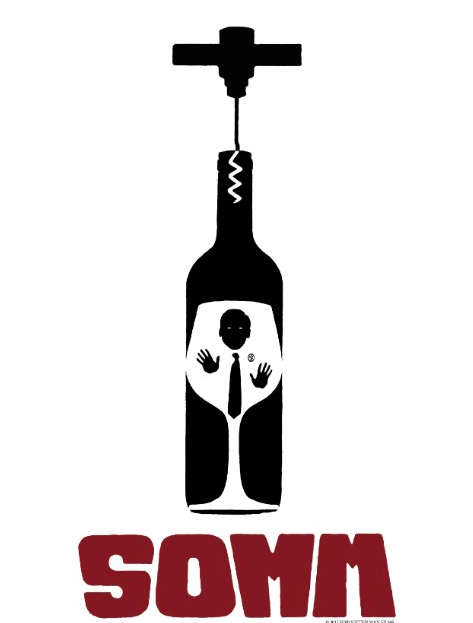 What I do love is a well done subculuture documentary - and I found one in "Somm." This film is about the hardest test you've never heard of (big up to T. Price), and follows four individuals as they put their lives on hold to study for, and test to join the ranks of Master Sommelier, a distinction held by only 200 people on our planet. You can't write characters like these, and that's why documentaries will always amaze and inspire me. Check out the trailer on YouTube and/or the full feature on Netflix Instant. And then pour yourself a glass of wine.